What can I say about this couple—-they were the cutest! A+K decided on early summer to marry in a symbolic ceremony at Borgo di Petrognano in Chiantishire. The couple wanted a small and intimate ceremony only inviting their closest friends and family. A & K chose Borgo di Petrognano in Chiantishire for their May nuptials. They wanted something intimate, and in the countryside yet polished. Borgo di Petrognano sits atop a hillside overlooking the rolling hills of Chianti and the medieval towers of San Gimignano. The venue was once part of a city wall for the abandoned town of Semifonte. The Bridal party was clothed in light and airy olive coloured chiffon gowns. The groomsmen wore smart black suits and ties….the groom—being very stylish wore a bow tie complemented with an olive and blush coloured David Austin rose. A and K chose to invite only their closest friends and family—- they wanted it to be intimate and relaxed..it was. 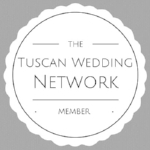 Andrea Piana from Tuscan Pledges organised a beautiful symbolic wedding ceremony overlooking the Chianti countryside. The couple passed their rings around for friends and family to warm them and share their wishes for the future. 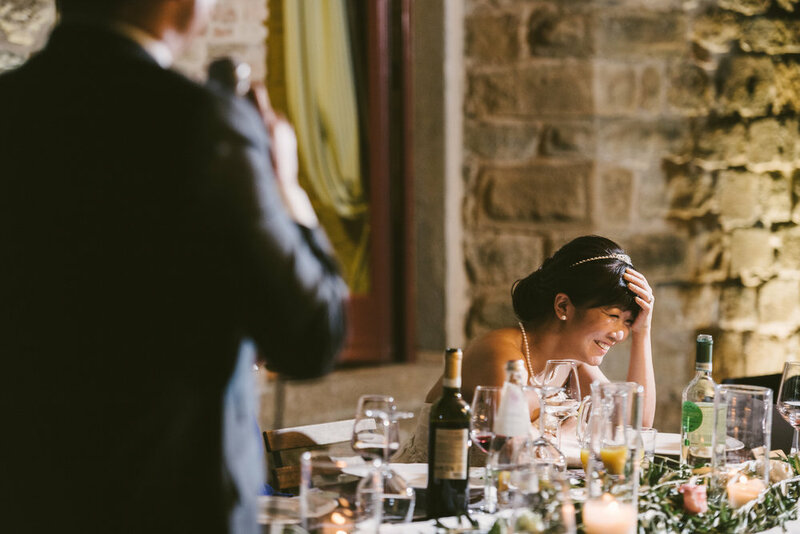 This was almost as important as the wedding ceremony for A & K. They decided on a formal dinner on Borgo di Petrognano’s beautiful terrace overlooking the Tuscan countryside. Guests admired the rolling hills and the outline of the medieval town of San Gimignano as the sun set behind them. The tables were elegantly dresses with white chiffon runners and filled with candles. Tuscan Wedding made special bespoke menus for the couple complete with a rose gold custom wax seal with the couple’s initials. The menus were closed within a grey sleeve. Olive branches and David Austin roses were laid out on top of the chiffon runners. A vase was placed at the head table for the bride to admire and enjoy her bouquet throughout the evening. The wedding guests enjoyed a delicious typical 5 course Tuscan meal. K even wanted all the guests to try Florentine tripe…and it was a hit. Guests enjoyed other local delicacies on white Ginori plates and rose gold utensils. Despite my best efforts to convince the couple to go with a Tiramisu cake from Giorgio Pasticceria in Florence—- they chose a traditional Italian Crostata filled with custard and topped with delicious fresh berries. The cake cutting was illuminated with bistro lights and sparklers. Afterwards the guests danced the night away overlooking the countryside.